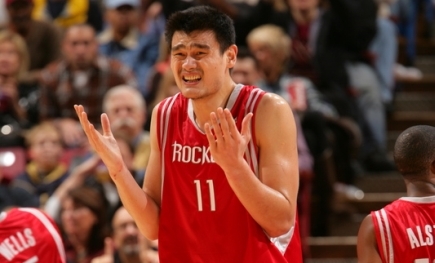 This picture of Yao Ming sums up the frustration he had in Sacramento in a Rockets 107-99 loss. Yao fouled out later in the game, got a technical for showing even more frustration, and was escorted to the locker room because of it. This photo is also an appropriate depiction of the frustration he and his teammates must be having by their terrible defense this season, and the inability for anyone to score consistently other than Yao and McGrady. Didn’t they fix all that during the off-season? Click here for more photos from the game. On Saturday night in Sac-Town, the Rockets got torched again on defense, just like they did against Golden State two nights before, letting the Kings’ superior athletes get to the rim way too many times on their way to a 107-99 victory. The Rockets got great point production from Yao (29 points) and Tracy McGrady (40 points), but the gaping holes from the other starters on offense at point guard (Rafer Alston – 5 points, 1-of-4 three-pointers), small forward (Shane Battier – 4 points), and Chuck Hayes (2 points) were too much of a handicap to overcome. Add little production from Bonzi Wells (8 points), Luther Head (4), Mike James (7), Luis Scola (0), and Steve Francis not being able to play because of a sore back, then you’ve got even more problems. We can’t really say that Yao and McGrady took poor shots that robbed their teammates of scoring opportunities. The two “superstars” made 22-of-45 shots together, which is about 50%. That ain’t bad. I would have preferred for McGrady to not take so many three-pointers. He made 5-of-10 treys, so he gets a pass from me because shooting 50% from three-point land is pretty damn good. But it’s the 13-for-37 from all the other guys that was the problem. If they had just made 5 more of those shots, or 10 points, to hit 50%, then you’ve got enough points to win this game. I had said a couple of weeks ago that I would be okay if the Rockets relied less on McGrady to score points, if he would just distribute the ball to get everyone involved in this newfangled offense Rick Adelman is trying to install. If McGrady does that and they still lose, then fine. I won’t be upset because then the players are either going to get used to this system once-and-for-all, or we’re going to ultimately find out which Rockets are not a fit for this system that can help them go deep into the playoffs. After seeing what we’ve seen over the last two losses, I think that day is soon coming, and I’m not talking about the former case, but the latter. Of course, everyone in the world sees one glaring problem being Alston, but every game we see Adelman putting him out there to start. It’s like Adelman is the captain of the Titanic letting Alston continue to take this offense down with him. Thursday night it was Baron Davis, and Saturday night it was Beno Udrih. It makes you feel like it’s time for the Rockets to fight fire with fire and give a speed merchant like Brooks the ball and let him be a threat to penetrate and score, or kick it out to Yao for a 15-foot jump shot or something. And remember during the preseason that Brooks proved he can hit three-pointers. What an extra bonus that would be! Of course, Francis should get more minutes at PG, and Mike James can come in to inject some scoring when needed. Maybe there’s a team out there who needs an average point guard like Alston to run the show. The Rockets also have to really think how long they can handle Battier’s struggles from the floor (0-of-4 from three-point land on Saturday night). It seems every good team is getting a ton of points from their small forward. For example, Memphis’ Rudy Gay scored 21 points Saturday night, and it looks like the scale is tipping toward the Grizzlies for who got the better end of that Gay-for-Battier trade. The Rockets also need to think seriously of bringing Steve Novak back from the D-League. I know he’s not the best defender in the world or the most athletic, but things are getting a little desperate for some perimeter scoring, and they need to get someone who can keep the defense honest and open things up inside for Yao. Right now the lack of any outside threat from Battier-Alston-Hayes makes it too easy for defenses to cheat down low. Of course, we’ve got to blame all players for the atrocious defense, letting Sacramento score at will. Remember how I said a few days ago how the Fox Sports Net-Houston guys were saying the Rockets’ defense was awesome against the Suns, and I was the only person saying that it wasn’t all that great, because it looked like Phoenix missed a ton of easy shots? Well, I think we saw in the Golden State game, and now the Sacramento game, how the defense never really improved. It’s hard to stomach how poorly they are playing defense after being so good last year, and it’s making Adelman look very, very bad. How embarrassing that must be. I guess that’s enough of my overall thoughts. Below are some other notes I took during the course of the Sacramento game, which includes some info on Yao fouling out, his technical foul, and ejection to the locker room. That kind of post would normally be the first thing I would write about, but because the Rockets were so inept, even if Yao hadn’t been called so poorly by the refs, I don’t think it would have made a difference in the outcome of this game. I watched the Sacramento telecast of the game on NBA League Pass, and there was a poignant comment from the Kings’ play-by-play man. He said that after Yao was tossed out of the game, some guy the announcer knew in Beijing had texted him right afterwards to let him know that everyone who was watching the game with him was absolutely livid at the refs for the fouls that had been called. Can you imagine if everyone in China who followed Yao texted the NBA league office to voice their displeasure? That’s when it hit me how powerful technology is that feedback like that can occur within seconds, and come from the other side of the world. Short of everyone in China texting the NBA league office, I’m hoping Yao’s outburst will get some attention from David Stern, and that he’ll be making a phone call to the guy who runs the officiating to finally change how they officiate Yao. When you’ve got a couple of hundred million Chinese pissed about how bad your league’s refs are, I’ve got to think the commish will be motivated to fix it…that is, if he wants to be successful expanding the league’s footprint in China. In the first quarter, Yao was a force early, scoring the Rockets’ first 9 points by crashing the boards on two missed shots, securing the offense rebounds, and putting them in. He also hit a jumper and a hook shot in the lane to make it 9-4. Meanwhile, Alston and Luther Head both were careless with the ball by throwing bad passes that got stolen, and Ron Artest taking it the other way for dunks. What are these guys doing in there? That’s four points given up right there. Yao would continue to work hard down low in the paint, hitting a layup after great ball movement, crashing the boards for another tip-in, and doing his patented spin move for a dunk! That was Yao scoring 15 of the Rockets first 18 points, with 6 points coming off offensive rebounds! Not bad! On the other end, the Kings were killing Houston by taking it to the rack early in possessions for layups before they could set their defense. So despite all of Yao’s great efforts, the Rockets couldn’t get separation, especially when the Kings went on a 9-0 run to make it 22-20, Kings. However, by the end of the first quarter, the Rockets led 29-26, with Yao having scored 16 points on 7-of-8 shooting and 4 rebounds. The Rockets started settling for jumpers in the second quarter, missing all of them. Mike James was the only one who was doing anything, taking it to the hole for a layup and hitting a three-pointer from the corner to score the Rockets’ first 5 points. A couple of possessions later, Yao caught a pass on a fast break and dished to Head, who took it in for a layup. Nice running of the break and assist for the big man! But then the Kings kept pushing it offensively, going on a 12-0 run to take a 44-40 lead. Chuck Hayes picked up his fourth personal foul with only 3:07 remaining in the 2nd quarter, so he had to check out of the game. Only when Yao hit an 18-footer did they break the Kings’ scoring run. The Kings were getting to the rim so easily, either off the dribble or passes into the lane, that the Rockets were lucky to have a 50-49 lead at halftime. By halftime, both teams had hot 42% from the floor and 20% from three-point land, but the Rockets were outscored 12-4 on fast break points. That’s what was killing them. In the third quarter, McGrady was sloppy with the ball, turning the ball over 3 times that resulted in 6 points for the Kings. The Rockets offense started to struggle, getting no help from Battier, 0-fer, and Hayes. At the same time, the Kings kept getting to the hole for easy buckets. It made me realize that even after a couple of years after Adelman had left the Kings, Sacramento is still able to run their offense without him, and it showed the Rockets the offense they wish they had. Kevin Martin killed them with 14 points in the third to give the Kings a 79-74 at the end of the third. McGrady scored 15 to keep the Rockets within striking distance. In the fourth quarter, the Kings scored 4 more points to take an 83-74 lead, and it took two 3-pointers from McGrady to even stay in the game – not something you want to do if you’re trying to focus on ball movement to find the open man. But like I mentioned earlier, if he hits them, I can’t be too hard on him. The Rockets still had a chance to win the game, though. When it was still 93-88, McGrady took it to the hole, scored on a difficult shot, and was fouled. I guess that’s the kind of shot the Rockets had to take to score, but on the very next possession, McGrady got greedy and fell too much in love with the jump shot, missing a long two-pointer. Shortly after that, Yao picked up his fifth foul on a questionable call when Ron Artest turned into Yao, who was just standing there, but Yao was the one who was called for the foul. Yao then fouled out a short time later when Beno Udrih took it strong to the hole with 3 minutes remaining, and ran into Yao on another questionable call. That’s when we saw Yao demonstrate some fire that we’ve all been waiting to see. After fouling out, he grabbed a towel from trainer Keith Jones and slammed it to the floor in front of the ref. That got him a technical and an automatic ejection from the court. After that foul, Udrih hit 2 free throws, giving them a 101-94 lead with 3 minutes to go. Mental errors the rest of the way gave the Rockets no chance, with Scola passing up a shot right in front of the basket and passing it to Bonzi Wells right next to him, but it was too close of a pass and went through Bonzi’s hands for a turnover. Why Scola didn’t shoot it confounds me. Maybe he’s hearing Adelman emphasize “ball movement,” but is taking it a little too far when he should be shooting a wide open shot instead. Then Rafer Alston fouled Udri with 4 seconds on the shot clock way out behind the 3-point line when he really wasn’t a threat to score, bailing the Kings out and sending Udrih to the line. Then a little bit later, Alston missed two free throws, and you can call it a night (and hopefully a one-way ticket out of town). Pathetic. This entry was posted on Sunday, December 2nd, 2007 at 4:00 am	and is filed under vs. Sacramento. You can follow any responses to this entry through the RSS 2.0 feed. As bad As Alston is, he is better than Mike James at the point. The Timerwolves thought he could be the man and gave him a huge contract, but MikeJ ended up not playing much. Sad to say, but it seems like James’ best days are over. Francis is probably better than either one of them. With that said, I agree with you that it is time to try the rook. let him learn his mistake and the game now. I like Shane B, and I think they did the right thing AT THAT TIME to trade for him. He had a good year last year, playing good D and hit open shots regularly, but this year, with 38% FG and 33.3% at 3PT, is hard to watch. Last year he was 44.7% and 42.1% at 3PT. In hindsight, it is always 50-50. It wasn’t like GAy was in the caliber of C.Anthony or Duran coming out college. The opposing teams don’t have to fear anybody when they double team TMac and Yao. This game is a good example of how other teams can completely ignore anyone not named Yao or Tmac. 70 points and 50%FG from TMac and Yao, the team still lost. The ball movement has been terrible and nobody on the team can shoot 3 — BWell shot under 20%, and R.Alston shot 26%, and Mjames, Heads, and Batteir shot around 35%. And their 2-pt FGs aren’t that much better. I hope this is the result of the players’ unfamiliarities with the new system, and with time, they will get better, otherwise the Rox will not make it to the post season. You’re right, Rafer’s shooting is a problem, but we knew he couldn’t shoot. What we didn’t know is that Scola would be slow to adjust to the NBA game, Hayes’ little offense from last year would completely dissppear, James wouldn’t shoot better than 39% (wasn’t he supposed to be the “instant offense”? ), and Bonzi would soon forget how to hit layups. For all the bitching about offense, the real problem is our defense. We are scoring enough most nights to win, but you can’t consistently give up more than 100 points in the NBA and expect to win. Even if we were winning while giving up that many points, it will come to bite you in the playoffs. The ONE thing we were good at last year is apparently gone, and that worries me. Problem is, there is nothing we can do about it. You can’t seriously tell me that a “contender” is going to play a rookie at point guard, a position where it is almost a general NBA rule that it takes three years to learn (he is not D-will or Paul). Plus, we won’t be able to move any of our points for a better one, figuring that they are all (yes even Francis) completely without market value right now – two who can’t shoot better than 40% and one who has whned his way into mediocrity. I really worry about the Rox long term progress as things stand. That said, love your page and keep up the great work, we all certainly appreciate you! Regarding Brooks, it looks like they may not have much choice. If it requires not being a “contender,” so be it. But remember back in the Barkley-Olajuwon-Drexler days, they had an average rookie point guard named Matt Maloney (who no one ever remembers), and they were good enough with him to go to the Western Conference Finals. So it’s not out of the realm of possibility. I also think he could be very good as a rookie, almost CP3 or D-Will, but probably more like T.J. Ford. I think you always do a wonderful job analyzing the game and I even think you could be a better coach for the rockets than Adelman, after watching and analyzing the rockets’ games for so many years. At the beginning of the season, I questioned about Rick Aldelman, I had concerns about his defense mentality, when yao and t-mac scores like that last night, and yet they still lost the game, it means one thing, the DEfense! Van Gundy may be old shcool and stubborn, but he is a defense minded coach, and you need defence to win games, especially in the west, we already have enough offensive teams in the west, can you score points like the Suns? or be explosive like the Golden States? or out score Dallas or even the Kings? No, you can’t, you are not explosive like that, and you have a big man in the middle, you have to play Defense like San Antonio to really win games, no matter how well you score, no D no W.
START LUIS SCOLA AND PLAY AARON BROOKS MORE!!! It is really painful as a die hard Yao fan to watch game recently. What really happened to this team? It played really well at season’s opening. Now everyone get lost ( Yao and McGrady are also on and off as well) Scola is awesome some nights but completely disappeared other nights. I know Steve can help them with his energy and penetration. But we need Shane and other to perform as well in order to have any chance in play-off. John, really love your work. I read your every single analysis starting from very beginning. And became a die-hard fan of Yao and Rocket partly because of your site. It’s the best analysis of Yao and Rocket anywhere around the world. I hope Rocket management is learning from your site as well. Wish Yao and his team can bring a title eventually to not waste all your great effort. I am more annoyed and disappointed by their lack of defensive effort than anything else. You are a great analysist of the basketball game. You have invented a great hyphenated word, Battier-Alson-Hayes, which actually means ‘Not Scoring’. And this hyphenated word sums up the problem the Coach who insists on playing the combination. One Battier is OK. But 3 out of 5 not scoring is way too much. To get to the root of the problem, replace the Coach. The sooner the better. If the difference between JVG and the management is too big to get over, think about the option of Thibodeau who knows this team inside out. I am sure he will be a good head coach, if he is given the chance. The GM has to make the decision and ACT now. No hesitation, please. Thanks for the compliment. I never thought about it, but yeah, “Battier-Alston-Hayes” kinds of runs together like “cod liver oil,” with the same offensive taste. the more games I watch this season, the more I miss JVG, we need a players coach, players need to play with passion, coach needs to coach with passion. I like mcgrady, he is hands down one of the best scorer in the league, but damn he needs to take less shots, coz t-mac style shooting is not the answer to win games, jacking up shots that surprise your own teammates is not something you want to do night in and night out, so plz tracy, stop that and drive to the hoop. the thing with yao, he needs to be aggressive on the court, when he intimidates like shaq and howard does, the ref is not going to make bad calls, for the refs to respect him, he needs to respect himself first, respect the fact that he is 7’6 at 300+ pounds and can power through anybody in the league if he is willing to do so. I hope this ejection will lit up the fire inside him. No one needs to scout the Rox anymore. Just double Yao and T-Mac, and dare the rest of the team to hit 3-pointers and outside jumpers. Easy. I also still have high hopes for Scola despite his early season growing pains. James is James, I really didn’t expect him to be any less streaky than he has been…but Wells’ recent play has certainly been a disappointment compared to how he played in the first several games. P.S. Love the site, John…been reading it since Yao first came into the league. Keep up the good work (but don’t kill yourself)! About the point guard question, Rockets are now loaded with point guards, I imagine someone’s feeling will be hurt if a rookie like Brooks is brought into the rotation. That might potentially damage the team chemistry and make things worse. Mike James is not playing particularly well, Luther Head can’t handle the ball, it seems with Francis injured, staying with Alston may be the only good option now. I have noticed something in watching the past few games in which Scola was succesful as well as when McGrady returned from his injury. It has nothing to do with my humble opinion of McGrady being a ball hog, although I tend to agree; it’s about Steve Francis and Scola. Here is one main thing I have noticed when Scola and Steve Francis play, Scola gets opportunities to shoot because Francis actually creates opportunities plays for Scola to show his worth. There’s stats and info there, it’s also a great way to analyze since Scola started playing more min. Here is an example, in the loss to the Suns where Scola scored 20 points, Francis also played. In the next game in which the Rockets lost to the Mavericks, Scola played but Francis did not, Scola had no points. Perhaps this is a sign of a maturity level from Francis not to mention he is more tolerant and friendly towards the intl players on the squad. The best solution right now is keep Yao, TMac, Luis Scola, Steve Francis, and trade everyone! Also, fire Rick Adelman!! Remember when I said that I wasn´t worried, ahead of the Warriors game? Now I am :p And I am p.i.s.s.e.d. o.f.f. I hope Yao can take the same leadership that he did on the CNT, remember him swearing at his CNT teammates, calling them out on the court? He should start doing it to his Rockets teammates, why is he still too reserved? Because they are americans? Big guy, you are the star and the leader! Call T-Mac out if necessary, yell at his face during the game, it will wake everyone up! Do you take donations, John?